By popular demand, we are proud to offer a selection of silicone Secretariat Spirit Bracelets. The muscular chestnut champion captured the affection and imagination of the nation during his stellar racing career. What better way to honor Secretariat than with these collectible keepsakes embossed with his name on the front and an associated message on the reverse. 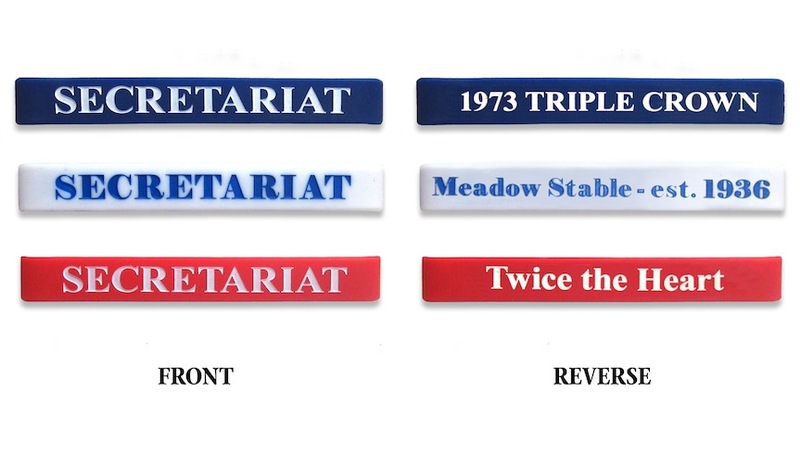 The traditional 1/2" bracelets honor Secretariat as "America's Horse" in a trio of colors. The blue bracelet features the accomplishment of the 1973 Triple Crown, the white bracelet honors the history of the Meadow Stable, established in 1936, while the red bracelet offers the inspiration of "Twice the Heart" referring to Secretariat's extraordinary physical anatomy and competitive spirit. Order one or save when you purchase the set of three. Show your true colors of affection with these affordable and inspiring mementos.